In a dimly lit room naked people are herded towards a chamber. There are murmurs, moans and stifled cries for help. The door shuts. A gaseous odor fills the air. The noises subside. The door opens to reveal a pile of corpses. The spirits have left. The bodies remain. It happens again and again--like clockwork. So routine. So cruel. Mass extermination. 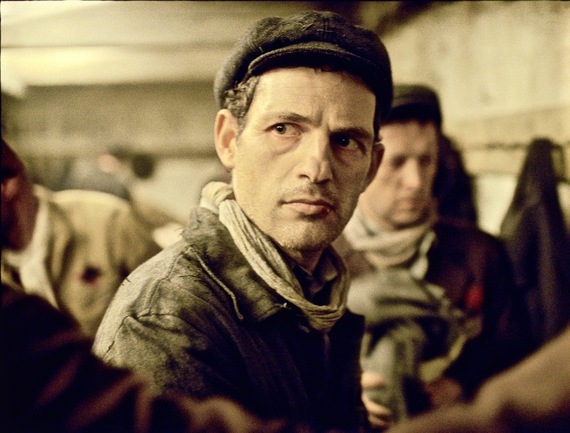 Géza Röhrig stars in Son of Saul. First time filmmaker László Nemes had an innovative creative strategy when he conceived his compelling Holocaust drama Son of Saul: "Staying with Saul [the central character] means not going beyond his own field of vision, hearing, and presence. The camera is his companion; it stays with him throughout this hell." Ingenious. In 1944, Saul Ausländer (Géza Röhrig) is a Hungarian member of the Sonderkommando, a group of Jewish prisoners forced by the SS to undress and lead frightened victims into the gas chambers at Auschwitz. A teenage boy, who lies on a heap of bodies, survives the fumes long enough for a gasp of air before he dies. Saul relentlessly seeks a rabbi to recite the mourner's Kaddish and give the teen a proper burial. There are those in the Sonderkommando who plot a resistance and escape. Saul is involved. They count on him. He is an integral part of their scheme. When it's most important, when he's in charge of a crucial deed, he lets them down. Even their freedom is not as vital to him as taking care of the dead adolescent he treats almost like a son. Why? Under László Nemes' direction, and the claustrophobic cinematography of Mátyás Erdély, audiences are drawn into Saul's sphere as he routinely does his job and begins a brave mission amid wanton genocide. What's beyond Saul's periphery, in the shadows, is even more ghastly than what we actually see. Nothing is done for shock effect; yet everything is shocking. Nemes based his screenplay on the book Voices from Beneath the Ashes, texts that were written by former Sonderkommando members who described daily, coerced tasks and their attempts to resist. "A part of my family was assassinated in Auschwitz," says Nemes. "It was something we talked about every day. When I was little, I had the impression that evil had been done." The dark gloomy production design (László Rajk), art direction (Hedvig Kiraly) and costumes (Edit Szücs) favor drab olive colors that cast a shadow and weigh you down. There isn't a wasted moment in the film, from the first blurry frames that become clearer every second to the final moments, and that's the result of ultra tight and precise editing (Matthieu Taponier). History, diaries and Nemes' personal connection to the Holocaust combined with his passion for sustaining a raw, dense cinema vérité style helped him create a deeply moving film. Son of Saul is a masterwork that leads viewers right to the gates of hell.